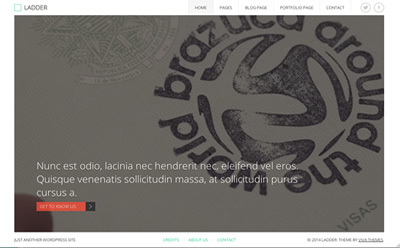 Ladder is a beautiful WordPress theme with 100% responsive design. With a modern flat design it will make sure that you present yourself or your company professionally. One of the main features of the theme is the ability to embed YouTube videos as a background or have an image instead, on every post or page of your website. In the front page you can have a slideshow instead of the video if that’s your choice. Embed a YouTube video or have a slideshow in the background of the front page. Ability to have a different video or image background in every post or page. Videos will fall back to images on mobile devices. Featured post or page in the front page.